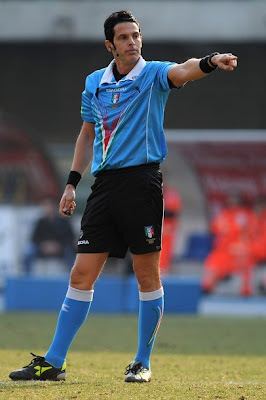 When we met Bologna in December, the biggest talking point of the match was the referee. From that match, Rocchi rightly got a couple of games suspension, as his decisions seemed to scream “I love you, Milan.” Without his “help,” though, I am not sure we would have shared the points, the 2-2 draw was a bit unfair to a Bologna side who outplayed us. So here’s hoping we can welcome Bologna to the San Siro with a fair ref but still relieve them of all 3 points, fair and square. No surprises. No pressure, De Marco, but we want a fair game this time. In the preview for the away match, I mentioned that Stefano Pioli was not likely to be coach much longer if they didn’t pull out of their tailspin, but luckily for him, I was wrong. 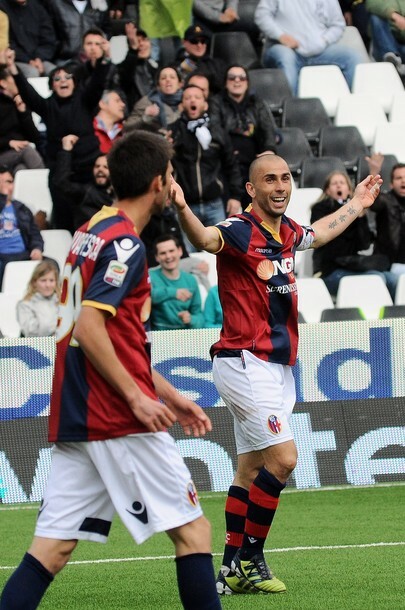 Bologna have flirted with relegation all season, but look to be safe now. That is actually good news for us, as they won’t be quite as desperate. But having been forced to share points with us in December, don’t think they won’t want to redeem themselves. Milan fans will be disappointed to know that Gillet is reported to be out injured. Gillet is one of those keepers who is quite underrated… until you are trying to score on him. While I wish him a speedy recovery, and prefer to play teams at full strength, I have to confess a sigh of relief upon hearing this news. Although if I recall, his backup, Agliardi, isn’t half bad, either. So who will be lining up against us? 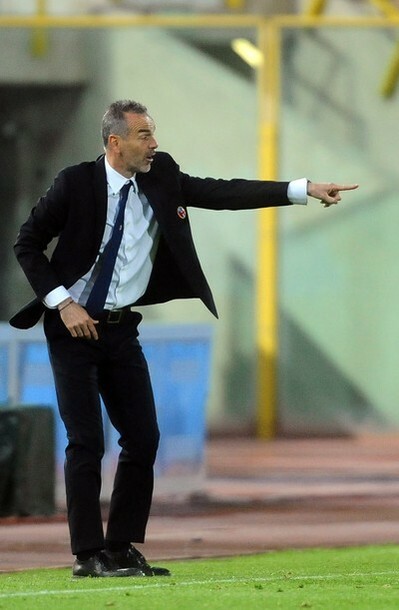 Well, Pioli lined up Gillet; Portanova, Cherubin, Raggi; Perez, Mudingayi, Diamanti, Morleo, Pulzetti; Gimenez, and Acquafresca when they welcomed Cagliari to the Renato Dall’Ara in their last match. Obviously, Gillet will be replaced, but you may have noticed a name that is synonymous with Bologna missing from that squad: Marco Di Vaio. He was suspended vs. Cagliari, but I’m certain will be back with a vengeance on Sunday. We'll have none of this in our house, Mr. Di Vaio. This means that Milan will need to be on their A-game, maintaining possession and fortifying the defense against a notoriously dangerous Bologna offense. Injury news is sparse these days, which I hope is good news, but I will share what I have heard. Abbiati should be fine after a minor injury vs. Chievo. Abate is back, ready to go, with a little extra time to get stronger having no games last weekend. Nesta trained apart from the squad much of this week, but I believe is back and ready to go. Thiago Silva, rumored to be coming back this weekend, will likely not play, as Allegri seems to be unwilling to make that same mistake twice. So it will likely be Mexes pairing up with Nesta. I believe both Antonini and Mesbah are back, rumor was that Allegri was choosing between them had we played last weekend. Our midfield is a little more optimistic, with Boateng being the most blatant omission due to a recurring injury (and not from her this time!) Ambrosini is also still injured, I believe, but the big news is that van Bommel is back, and not a match too soon. So Allegri has his choice of van Bommel, Aquilani, Nocerino, Muntari, Urby, Seedorf (hey, he did score against the Rossoblù last time!) as well as Gattuso and young Merkel, too. 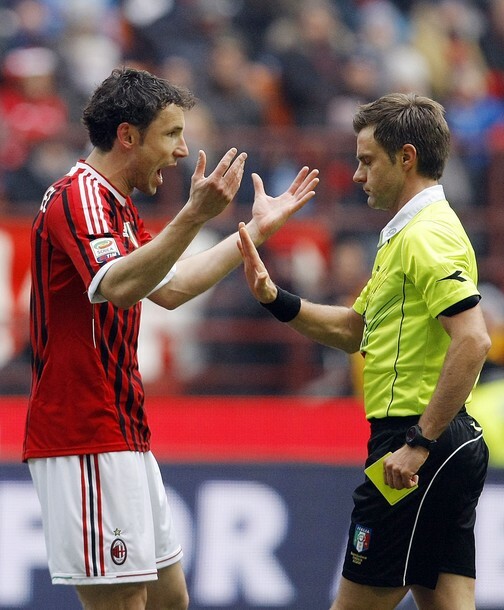 Van Bommel: "But I haven't even stepped onto the pitch yet!" Up front, Allegri is still missing Pato and Pippo, although I always wonder if there is a mothball filled closet where he keeps the latter, labeled “injured,” as Inzaghi was never injured this much before, and never seems to be mentioned in training, either. Hmmm. Anyway, Ibra is an obvious choice to start, even with the broken hand. The other start is trickier. El Shaarawy has been great, Maxi Lopez impressive, Robinho not quite at his best lately, but usually pulls out a decent performance. But with Pippo in the mothballs, I have a new cause: Allegri, for the love of the Azzurri, give Cassano some time!!! I know it is scary after recent events, but he was lucky, and his heart is fixed now. Also, he deserves to earn some more assists and maybe even score a goal or two for Milan. 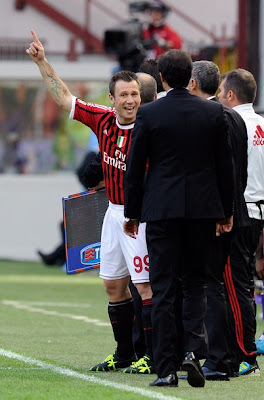 Cassano: "But Elaine said I need to play, coach"
Milan are the obvious choices to win this one. Milan need to win this one if we are to keep the Scudetto in reach. But Bologna will be fighting for honor, and maybe for that three points that were denied them in our December meeting. Milan will have to be careful, as Ibra, Seedorf, Zambrotta, and Mexes are each one yellow card away from suspension. Injuries are one thing, but losing important players to suspension at this point is in our control. Many have said that other than the derby, which is now a little less certain with a revitalized Inter, we have a pretty easy schedule. But that complacent thinking is exactly how trophies are lost, not won. We need to face this and every match as a final, as several of the players have said, six finals to win the title, with maybe a little help from one of Juve’s opponents. But the only thing in our control now is how we play, and obtaining three points, no mercy. And that includes you, Bologna. Sorry, no surprises this time. This match will be shown on ESPN3 in the U.S.